Club captain Bruno says Albion have to match – if not exceed – their standards next season. 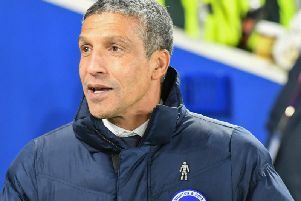 The Seagulls finished 15th in their debut Premier League campaign and the target at the start of next season will again be to stay in the top flight. Bruno, 37, played 25 times in the Premier League and felt the team showed a lot of progress from their opening game against Manchester City until the final game at Liverpool. He said: “We’re so different, we’ve proved already we can play in the Premier League and beat any team. Looking back on the season, Bruno said the victory at home to Manchester United which sealed Premier League survival was his top moment. He said: “The most special game was Man U at home because of the whole performance.